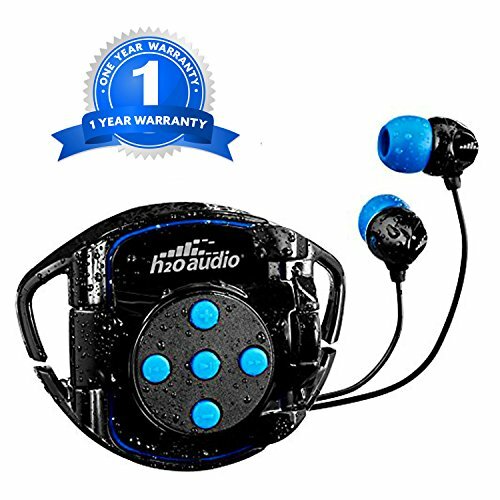 Powered by the H2O Audio technology, the waterproof Interval swim solution features waterproof earphones with a waterproof iPod shuffle case perfectly designed for the current generation iPod and is also compatible with other square iPods. Underwater Swimming headphones are designed for lap swimming and the H2O’s superior construction and durability protects your iPod Shuffle up to 12ft/3.6m underwater without compromising Apple’s warranty. We have included short headphones that directly connect with the Interval at the back of your head allowing you to swim like it’s not even there. The integrated goggle loops makes it easier for you to attach on any swimming goggles and makes your swim pleasant. The Interval’s push buttons align with the water iPod Shuffle button controls for volume and music tracks. SUPERIOR SOUND. These headphones are sweat proof, waterproof and noise cancelling. Our headphones for swimming has been awarded the highest waterproof IPX rating of IP8 enabling superior quality sound in and out of water up to 12ft/3.6m. COMFORTABLE & EASY TO USE. Designed for athletes by athletes with innovative and highly satisfying technology. Ergonomic sheared shape sits flush with the ear and is designed to promote proper alignment of the ear bud with the ear canal making it comfortable for you. Includes 5 sets of high quality earplugs (XS-XL) and tree tip set to ensure that these earphones stay securely in place while in activity. PEACE OF MIND - Buy with confidence! Our product includes industry leading 1 YEAR WARRANTY. We stand behind all the quality products that we make. INTELLIGENTLY DESIGNED. Integrated goggle loops on this waterproof iPod shuffle case make it easy for you to attach on any swim goggles. Short headphone wires and high quality earphones make it convenient to contain the entire sound system on your head keeping your arms free of wires thus making it a perfect swimming accessory. Includes waterproof iPod shuffle case which gives you full control of your music for the iPod shuffle 4, 5, 6, 7. The light weight iPod case makes it convenient and easy to use. Push buttons align with the waterproof iPod button controls for playback and volume control in the water or out. If you have any questions about this product by H2O Audio, contact us by completing and submitting the form below. If you are looking for a specif part number, please include it with your message.